EN Hello guys!!! Today I wanted to speak about the newest Lush range for Mother’s day which will be on the first Sunday of June in Luxembourg. In Lithuania we celebrate this day on the first Sunday of May, in Belgium the second Sunday of May and in Luxembourg it’s only in June. It’s a second year when I was invited to attend a #LushBlogParty in Luxembourg city for a Mother’s day range presentation. As always it was such a fun and nice evening. At first we had an opportunity to create our own flower bouquet for our mothers. I must admit I really enjoyed putting my flower arrangement together, it felt somehow relaxing and I was very happy with the result. Unfortunately, I couldn’t gift it to my mother as she is in Lithuania, so I got it to keep for myself. Lucky me. After that the shop assistants made a cute presentation of all products dedicated to Mother’s day by telling a fairy tale and presenting each product at the same time. It was really nice. LT Sveiki visi!!! Šiandien noriu pasidalinti su jumis naujausiu Lush kosmetikos asortimentu skirtu Mamos dienos proga. Taip, Lietuvoje mamos diena jau paminėta, Belgijoje taip pat (antras gegužės sekmadienis), tačiau Liuksemburge ji bus minima tiktais birželio pirmą sekmadienį. Tad ta proga jau antrus metus buvau pakviesta į #LushBlogParty Liuksemburge Mamos dienos progos asortimentų pristatymą. Kaip visuomet vakaras praėjo labai linksmai ir maloniai. Pirmoji vakaro veikla buvo gėlių puokštės kūrimas. Kiekviena iš mūsų turėjome nuostabią galimybę iš daugybės gėlių sudėlioti puokštę savo mamai. Turiu pripažinti, kad man labai patiko ši veikla, kuri kažkaip labai raminančiai paveikė. Taip pat pavykęs rezultatas nuteikė maloniai. Deja, neturėjau galimybės padovanoti šios puokštės savo mamai, nes ji Lietuvoje, tad teko ją pasilikti sau. Skųstis negaliu. Po to parduotuvės asistentai pristatė produktus sekdami pasaką ir demonstruodami kiekvieną produktą. Buvo labai gražu. 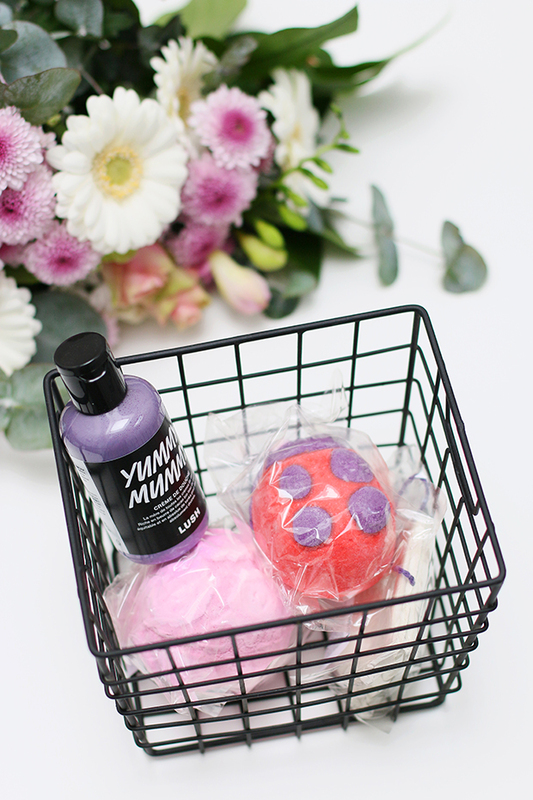 So you could surprize your mother by offering her one of the Lush products like: Ladybird – the bubble bar filled with peppermint oils and geranium that are balancing and uplifting. Or you could choose bright pink bath bomb Rose Bombshell. As the name reveals, it has a nice rose scent and rose oil inside as well as Sicilian lemon oil. If your mother is a tea fan, the there is a perfect bubble bar Floweringtea for her. Packaging is so cute, like a real tea bag that allows you to have a giant tea cup in your bath. The last and my favorite is the shower gel Yummy Mummy which has a beautiful purple color and smells sweet and fruity. I really like the majority of the bath bombs and bubble bars from Lush, but shower gels and body lotions/conditioners stay my favorite, because of their hydrating qualities. So all Luxembourgish daughters don’t forget to surprize your mothers!!!!!! I love your photos, you always seem to have such nice ideas to arrange everything!